Aden has four voices inside his head and if that wasn’t enough, he has four supernatural powers. Eve can time travel, Julian can raise the dead, Caleb can possess another human, and Elijah can predict the future. As Aden bounces around from foster homes, juvie, and insane hospitals, he feels more alone despite the four souls in his head. When he ends up in Crossroads, Oklahoma everything changes. Elijah has a vision that he will kiss a dark haired girl that will change his life and also that Aden will die soon. On the day Aden is fighting zombies Julian accidentally raised, he is suddenly drawn to a mysterious girl that he feels he must hug but at the same time, to run away. Aden knows there is something strange about this girl. Could it be the dark haired girl he will kiss? Or does she have the clues to finding out what is going on in his head? The Good: This novel was one of those that you get to page like 300 and you look back and nothing huge happened but yet the pages flew by. But don’t get me wrong this book was great, filled with lots of mystery and intrigue. This was and interesting combination with the supernatural. Usually in the paranormal genre that usually entails big battles between vampires and werewolves or running from psychotic enemies. And while that may seem stereotypical this novel was totally unique in a very good way. I am often hesitant of male protagonists. I find some to be completely unrelateable. But Aden (and his companions) were very easy to read and provided a fun, interesting, unique dynamic. The Bad: I felt the lack of excitement throughout the book slowed its pace slightly. While the ending was climatic, it lacked the proper build up to make it especially exciting. But overall Showalter did a good job of being unique in what seems like an overcrowded genre. Ugly Updates: Showalter has published many other books in the paranormal genre. Unraveled, the sequel to Intertwined, comes out August 31st! 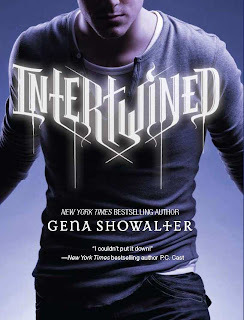 So get reading Intertwined so you're all ready when it comes out. Check out Showalter's site and order Intertwined and Unraveled on amazon.